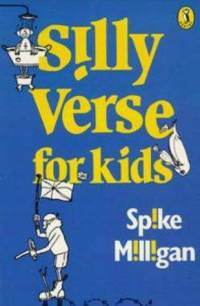 I briefly mentioned Spike Milligan’s brilliant book of children’s poetry and songs, Silly Verse for Kids, in this post last week, and decided it deserved a little bit more attention, especially as it is Poetry Month still (also, I just love Spike Milligan). Written almost half a century ago, this small book contains over thirty rhymes, all with Milligan’s own ridiculous drawings (which feature prominently in his other books too, including his war memoirs), which were written either to amuse his children, or as a result of things they had said at home. The poetry and songs aren’t particularly amazing in terms of poetic technique, but they are funny and are quite clever in terms of content, still retaining enough of a musical quality to make them fun for children (and, let’s be honest, fun for adults too – I’m twenty-five but I still enjoy reading this book). Some of the rhymes in this book became quite famous and are still sung to children today – in particular, Spike Milligan wrote On The Ning Nang Nong, a song I grew up with, but which I only attributed to Milligan recently. There are a few others that I particularly enjoy, that I thought I’d share for a bit of fun. The first is a cute one about a Granny struggling in adverse weather, the second is making fun of the stereotypical English teeth (which as an English born man with imperfect teeth, I can appreciate), and the last is just plain silly (the third line of which goes off the page in the book…you’ll see what I mean). (And up her nose as well, I fear). It nearly made the vicar curse. Just missing him (and other people). It blew on man; it blew on beast. It blew on nun; it blew on priest. I know there are many other great books of children’s poetry and song out there, but this is one book that has certainly grown on me, in all its silliness. It makes me want to write similar rhymes for my children, one day, and any book that inspires one towards writing of any kind has to be worth a mention. Have you read this book before? Who’s your favourite author of children’s rhymes (if you have one)? This entry was posted in Books, Poetry and tagged Book, Books, Failure, Granny, National Poetry Month, On The Ning Nang Nong, Poetry, Silly Verse For Kids, Spike Milligan, Teeth. Bookmark the permalink. These are so much fun, I love the English Teeth! Glad to hear! 🙂 They are a lot of fun, aren’t they?! I need to get my hands on this, I’ve never read anything by Milligan before. Ooo, I love “Failure”, not failing, but the poem. I do believe I once wrote something akin, simply for the sake of being silly! Hahaha, yeah, that one makes me laugh, it’s just so utterly silly. I think Milligan is often at his best when he is just being silly, whether it’s poetry or his other stories and books. Reminds me actually, I have a really silly quote of his to add to my quotes page…. 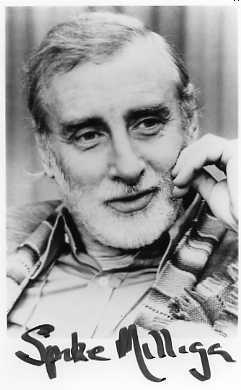 I like Spike Milligan too although i don’t know this book. I have a feeling this is one of his oldest books, although the edition I have is published in 1968 some of the poems are credited to being written in the 1950s, which was before he had published anything. Also, he jokingly wrote at the start of the book “I dedicate this book to my bank balance” which makes me laugh every time I open the book. I know what you mean – the usual nursery rhymes do get a little bit tedious after a while. Those two books you mention sound interesting! I know there’s a few “aussie” rhymes books too, I don’t know if they’re as popular now as they used to be though.